New Storrington manager James Everett will be taking it one game at a time this season although believes if things go right there is ‘no ceiling’ on what they can achieve. 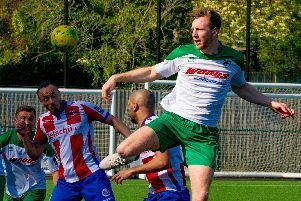 The former Worthing Leisure manager was on the coaching staff at Swans last season - having played for the club in the last 90s and 2000s - as has taken over at the helm for their Division 1 campaign. There have been a number of changes at the club, starting with a new management team in place including assistant Alan Tucker, coach Lee Kennedy, supported by Matt Nelmes and Guy McGilligan, who will run the reserves. Player wise, Josh Clarke, Jay Hide and Charlie Witham have all joined the club from local rivals Steyning Town, Dan Geere joins from Worthing Leisure along with new signing Lloyd Carter. Former Swans Luke Jearum, Russell Shoebridge, Dave Francis and Kelvin Hobden are all also rejoining the club. Leaving the club is Jack Boxall and last season’s manager John Rhodie, who is joining Shoreham, despite hopes he would continue his long association with the club. With plenty of changes, Everett is not getting ahead of himself, but can see potential. He said: “The aim is to win the first game of the season, then we will prepare for the second game. “It is also to instil a winning mentality at the club and to break the habit of accepting a defeat. If we maximise the potential within the squad we have to be competing every week against whoever we come up against. “If the players can realise this there will be no ceiling on what we can achieve as a group. There are also improvement happening off the field with new dugouts in place and a brand-new 50-seat stand installed. As well as that, the Swans have linked up with Storrington Vipers - a youth club with teams aged up to under-16s. Everett added: “With the club forging links with Storrington Vipers there is the hope players from this youth set-up will be the future of the club by providing them with a clear pathway to County League football. Swans kick-off their Division 1 campaign on Saturday at home to Wick.